So sang Bob Dylan in Buckets of Rain. 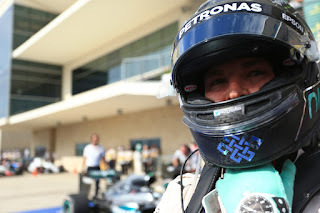 And appropriately in the self-styled live music capital of the world, Lewis Hamilton harnessed the great songster Dylan in his Austin weekend. He did what he must do, and did it well. The trouble for him was that Nico Rosberg did too. 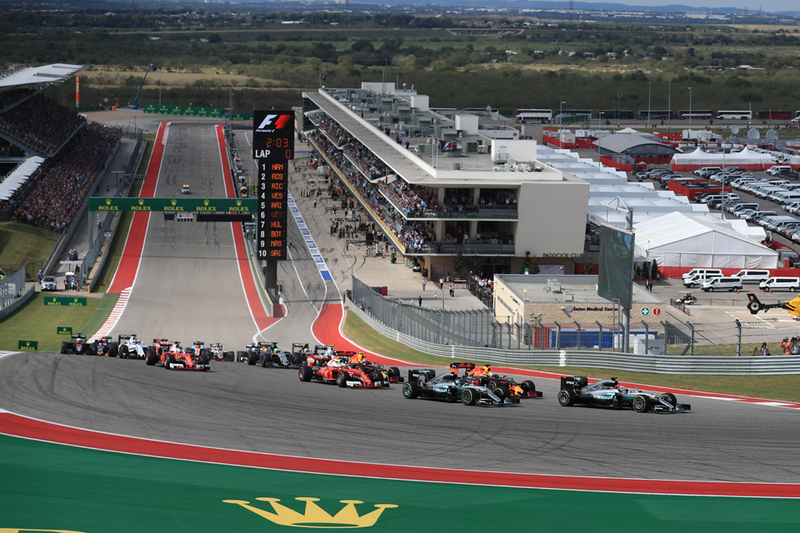 There was only one real question for Lewis ahead of today's United States Grand Prix - whether he could get off the line with his lead intact. His major bugbear of 2016. He did, and quickly as an observing Nigel Mansell noted it was then a matter of him ticking the laps down. That, at a track and venue he adores, is loosely what he did as well. "I've been relaxed all weekend and I feel like I knew the start was going to go well," Lewis said later. "That's the first time in the whole year that I didn't spin the wheels. "The States has been good to me and I don't know why, I love it out here. "Honestly I don't have any more focus or will or determination when I'm here than I do anywhere else, it's just the track feels great here." He didn't scamper away, but that's not the modern sport's way. Instead he eked clear, and once the whole thing had settled down his lead was something like ten seconds, where it hovered for most of the rest of the day. The congratulations from his team on his cool down lap after the rather inevitable victory summed matters up. "Well managed...well controlled." Accurate, and a compliment. But also perhaps an indictment of where F1 has got to. As noted he didn't scamper away, but his lead was about as secure as if he had. 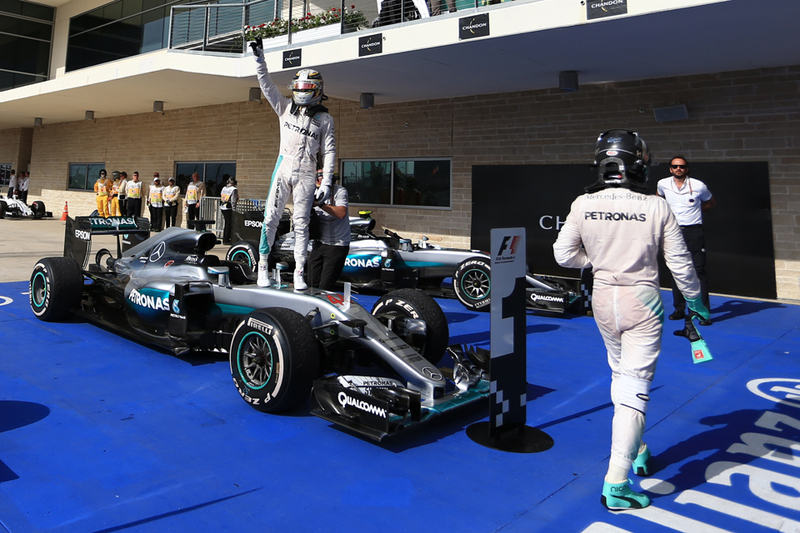 "I guess it was a boring race for the spectators, but for us it was good" grinned a frank Toto Wolff afterwards. Lewis though as may be his way added some intrigue, as he seemed at pains to point out a small technical problem, related to his overnight fuel system change before Saturday. Contradicting his boss Wolff somewhat he claimed it was costing him power, as well as that it concerned him reliability-wise. "Today was the longest afternoon that I had" Lewis said, "I didn't know if the car would make it. That was my biggest concern the whole way. "I was down on on power today compared with Nico" before musing on "the reliability issues that only we seem to have..."
Ouch. Still, the problem seemed minor (even Lewis said it amounted to just 1-1.8 seconds over an entire race distance) and Martin Brundle wondered if it was from Lewis "a power play [with the Mercedes team]...a little point, he's poking things." 'Yes it was a small problem, but it's still a problem. Another one', seems the message. The race launch got even better for Lewis as third-place starting Daniel Ricciardo - starting on softer tyres - got ahead of Rosberg and looked perfectly happy staying there. But even that had its tension ripped away in an untimely fashion, and did it as Red Bull scored an astonishing own goal. Ricciardo and Rosberg had diverged on strategy with Nico taking the medium tyres on at his first stop rather than the more standard softs. 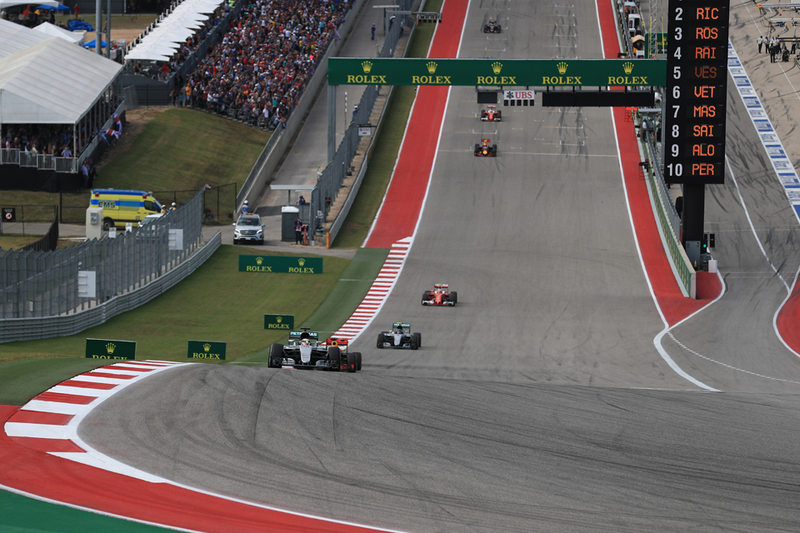 Ricciardo made his second halt on lap 26, also taking on mediums, so to run to the end. Nico was due to take on softer tyres later and presumably would then be quick but Danny Ric would have track position. Whatever, as Red Bull boss Christian Horner noted, "we would have given it a good go". But as noted the team fired the ball, and elaborately, into its own net. It started with the other Red Bull of Max Verstappen, who'd run with his team mate and the Merc pair to make a quartet, but rather removed himself from it by somehow imagining a call to pit Mika Hakkinen style. His crew of course were surprised to receive him and the stop was tardy... It mattered little though as a few laps later he was touring with some kind of technical problem. And kept touring... eschewing plenty of sensible places to park, apparently at his team's behest. Once his team eventually told him to give in he left his car in a slightly odd place. Then to add the coup de grace his RB12 apparently got stuck in gear. "It was in neutral, but the car got stuck" said Max. "You can press a button on the top [of the chassis] but that didn't work." The upshot was that the matter had escalated to the point that the Virtual Safety Car was deployed. In another thing that the modern sport is gradually waking up to the Virtual Safety Car has considerable impact on race strategies, with those due a stop being able to dive in and lose minimal time as all are forced to circulate at restricted pace. 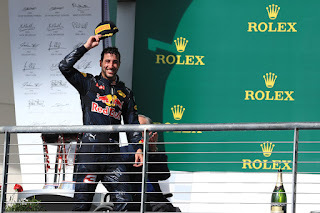 This is what we got again, and chief among the losers was Max's stable mate Ricciardo. Both Mercs made their final wheel changes smartly, and emerged with their one-two in place and with newer boots than the pursuing Australian. After the race he was more coherent. "Unfortunately the Virtual Safety Car I think made it a pretty boring finish..." said Ricciardo. "It [second place] was definitely ours, at least for that moment. And even if Nico caught me in the end I was not going down without a fight. I was looking forward to the battle. I was pretty upset, but that's how it goes." They finished in that order, so Nico did what he must and followed his team mate home in second without rancour. Such things are easier said than done of course, especially so in a season that even with the Merc dominance this was only its fifth one-two from 18 rounds so far. Plus abandoning the attack mode that has served you well for a defensive one isn't always advisable. But the bald fact is that repeating that result in the next three rounds will guarantee Nico the title. Nico, as before, insisted he's not viewing matters that way though. "No I don't see it like that" Nico said, "as I wanted to win the US Grand Prix today, and it didn't work out. So I'm not ecstatic of course, but Lewis did a great job this weekend...so there was nothing I could have done. "I'm well aware of the championship situation, it's exciting to be in that battle. But for me to do the best possible job it's just to keep things very simple, that's what I like to do and that's been feeling good to me. "So when I go to the next race in Mexico I'm going to go for the win because I'd love to get the win there." But Lewis, probably not intentionally, got close to Dylan's lyrics in his own aim. "All I can do is my best." That doesn't really apply to Ferrari these days, which had a rather typical for 2016 day in Austin's race - not brilliant pace and not at all making the best of it on strategy. It has been said frequently by Peter Windsor that Ferrari has pressure from on high (i.e. Sergio Marchionne) to always be aggressive on strategy and run softer compounds if possible. Fine in itself as a general calling card, but not if you still apply it at times when it doesn't make sense (arguably it cost the team race wins in Australia and Spain), and today was our latest example. When everyone was bolting on mediums to run to the end - indeed Ricciardo's final stop mentioned was just a lap later - Kimi Raikkonen got supersofts. Then he didn't pit under the Virtual Safety Car when it looked for all the world it would be helpful to do so. In a coup de grace of his own once his final stop did happen he had to park as he was released with a wheel not attached (which the team got fined for). Sebastian Vettel finished a distant fourth, not helped by his rear wing "dropping out" due to debris stalling it occasionally. He said he "could have had a crack at the podium" without the Virtual Safety Car which seemed fanciful, he did however get fastest lap after pitting late to set that mark for the sake of it. It was a move we'd grown to associate more with Fernando Alonso at McLaren. He indulged in more gay abandon today but with it was able to finish in fifth place after late moves on Felipe Massa and Carlos Sainz, the first of which can be described as, erm, elbows out. 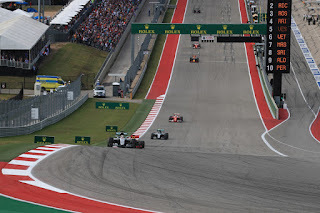 Alonso was on the outer edges of optimism with his dive for the place, but Massa too not for the first time showed clumsiness in battle, this time by turning in when Alonso was alongside, and they collided and both ran off the track. The stewards appeared to agree by taking no further action, on the grounds that they "examined the evidence and concluded that no driver was wholly or predominately to blame for the collision". Out front though both Merc pilots continue to do what they must. But for one of them, inevitably, even this will not be enough.